Callie is cousin to Luna Lapin, a little French hare. Originally I planned to use wool felt for Callie’s body, and I ordered it online from The Felt Pod. 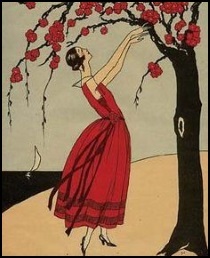 But I couldn’t work with it – allergies. So I opted for grey kona cotton, which works really well. I drafted my patterns with a 1/4″ seam allowance and sewed everything on my machine. I find it easier to sew small doll pieces using the pattern on top of the fabric, with a very small stitch length (2.2 on long edges, 1.2 around curves). After tearing away the tissue, I cut out my pieces with pinking shears. The pinked edge is safer than clips on curves and adds ease to all the seams. I happen to like floppy ears on rabbits, so I redrew her head and lengthened her ears (more in a later photo). I’m always happy when all the body parts are sewn and I can start turning and stuffing. 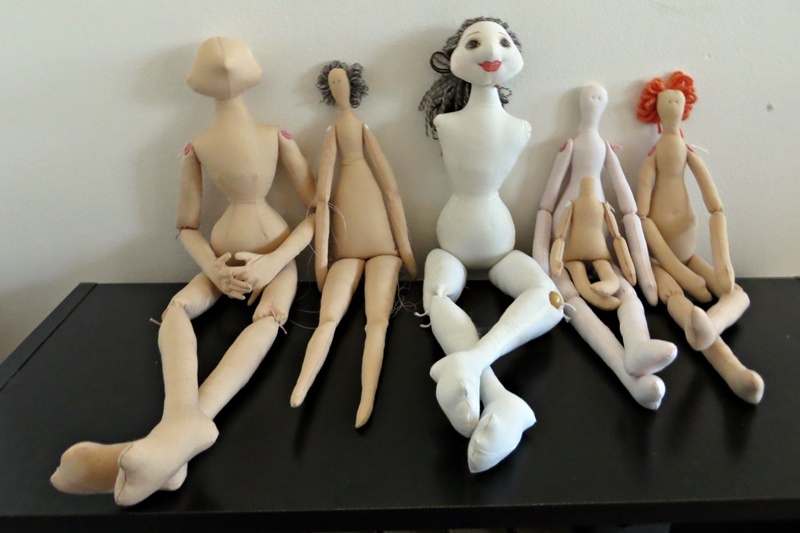 Over years of making fabric dolls, I’ve collected and adapted some great tools. 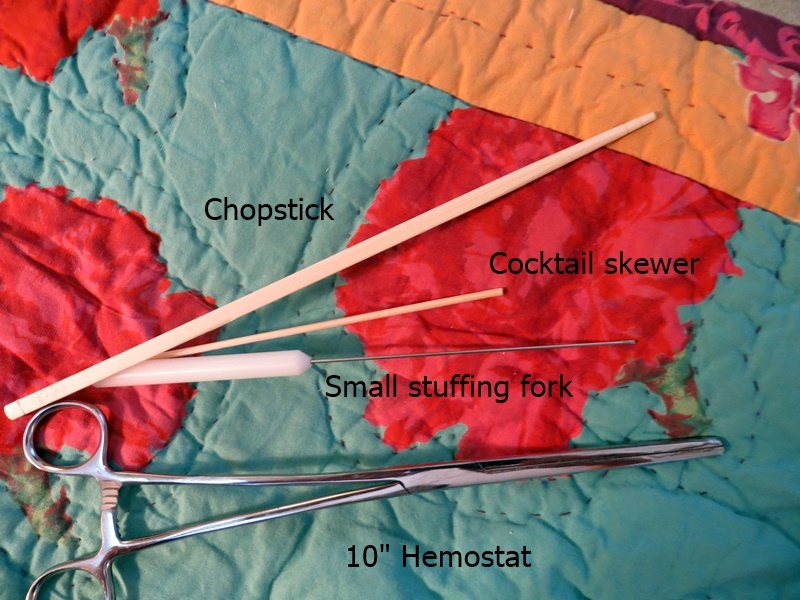 Chopsticks, manicure sticks, cocktails skewers, hemostats, and tweezers. I also find doll needles to be indispensable. 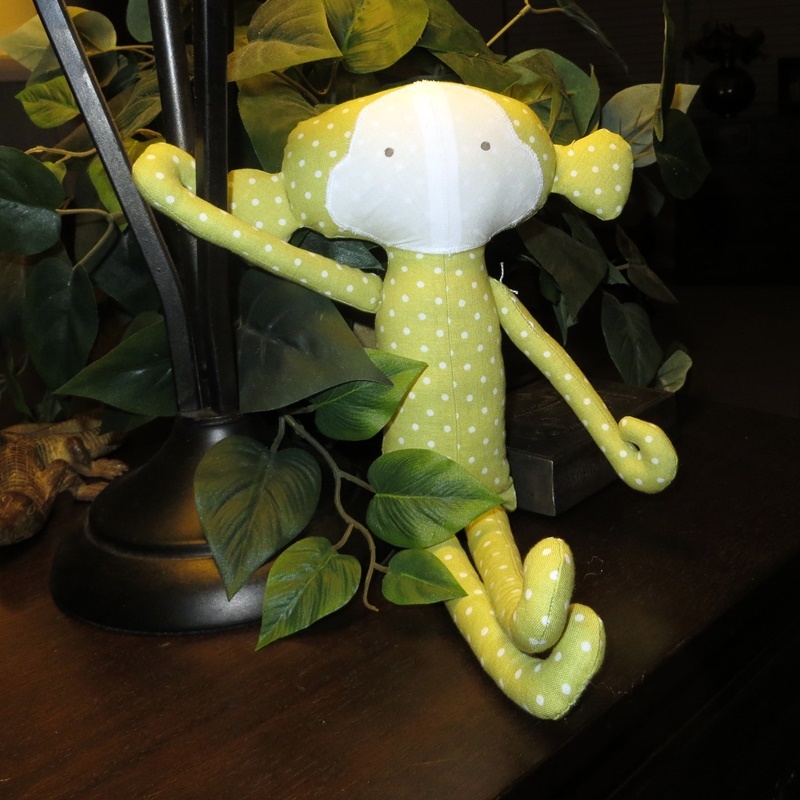 I used one to stabilize the head while I attached it, and ran one side to side, straight through the body and head, to attach the arm buttons and eyes. 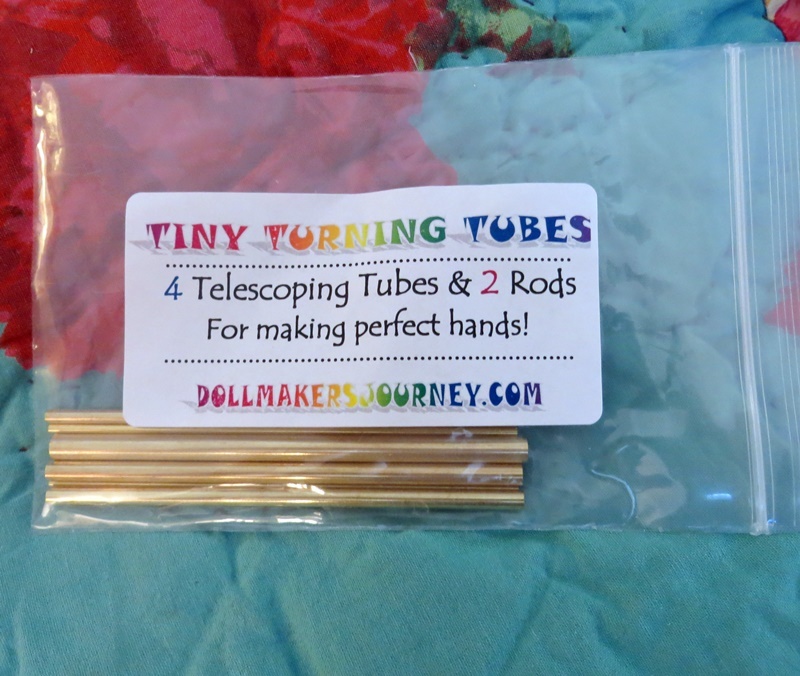 Doll Makers Journey is my go-to source for tools, fabrics, and much more! Callie has a pink nose, eyes, and shoulder buttons. Outlining her nose with thread made the embroidery work very simple. She was fun to make, and I plan more outfits as well as some flip-flops in her size. Rather than do more posts here, I’ve set up a Pinterest board for Callie and any other Sarah Peel designs that grab me. 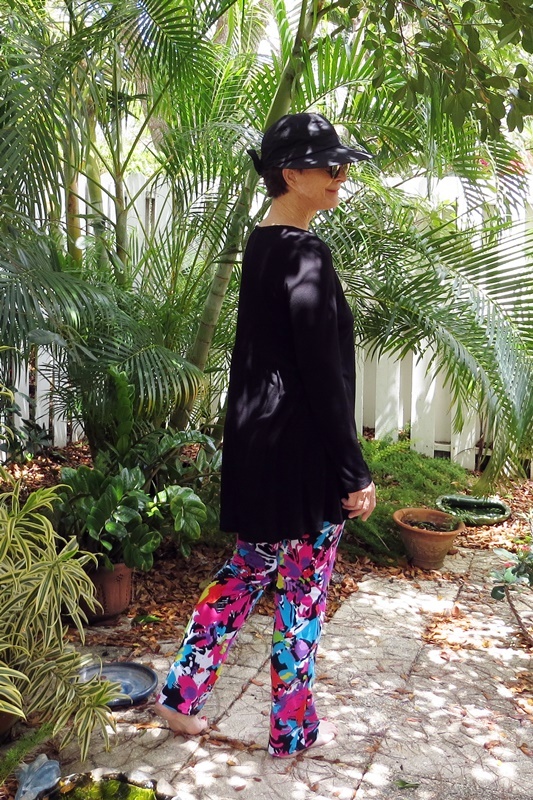 One or two was not enough…more Sabrina Slims! I admit that sewing has slowed down a bit in the loft. I think it’s because I’m really enjoying my ‘culled’ closet. 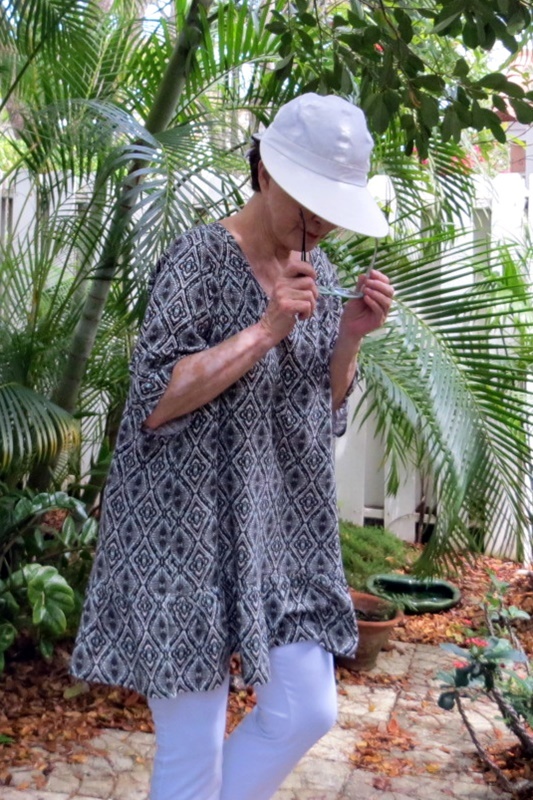 It has only my very favorite clothes now – and it’s so easy to choose something to wear. Who would have known? Less is more? 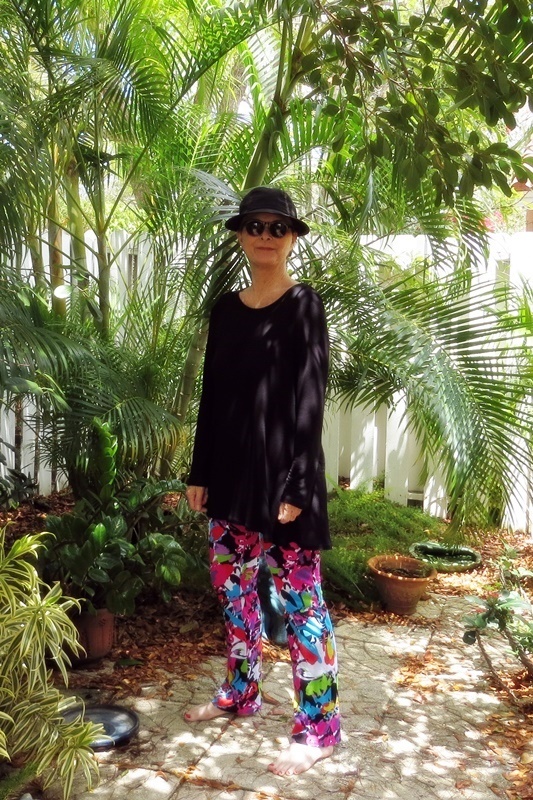 I used a medium weight (10 oz) cotton spandex knit from Girl Charlee for the white pair. 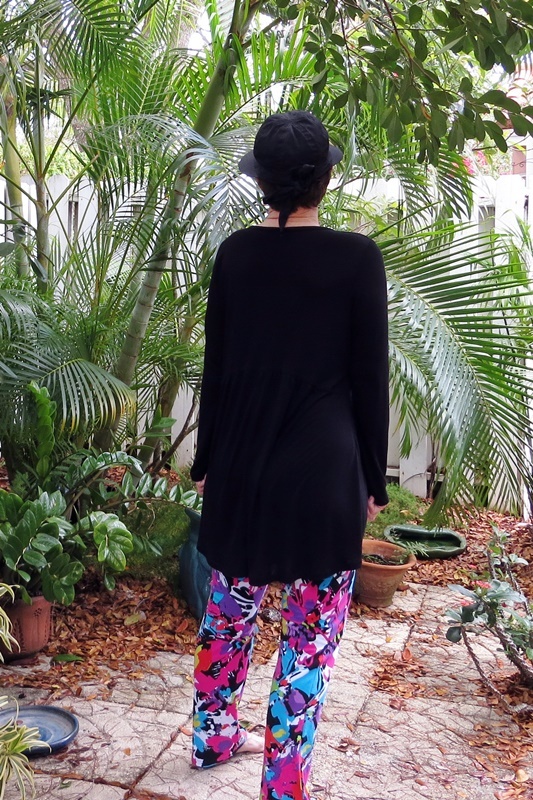 It has 4-way stretch and is perfect for these pants. 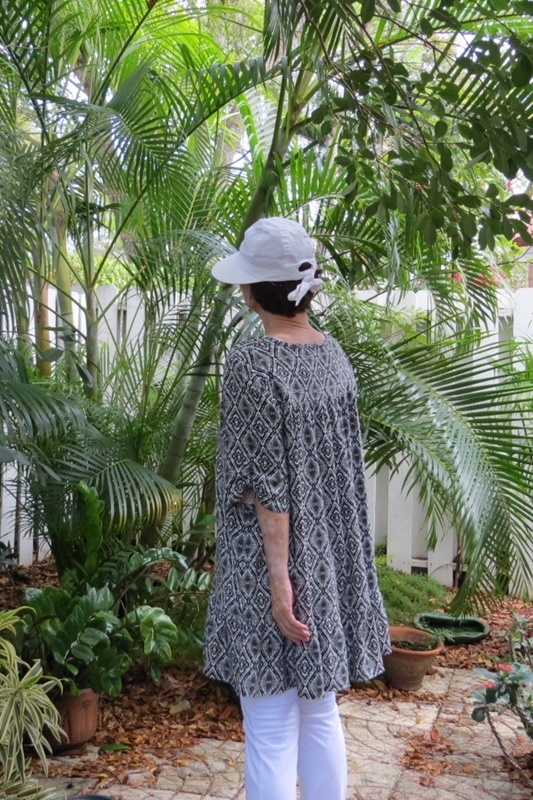 And as long as I was doing repeats, I made another McCalls 6987 tunic to go with. 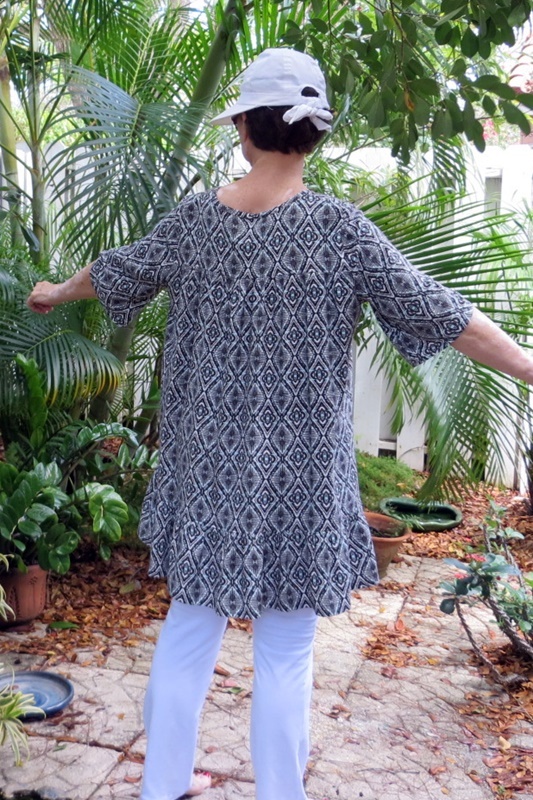 I don’t see much of this tunic on the web, and I imagine it’s not terribly popular – the envelope pic is awful. But I really like it. Done in challis, it’s weightless and just floats around. And here’s is the floral print! I love it. 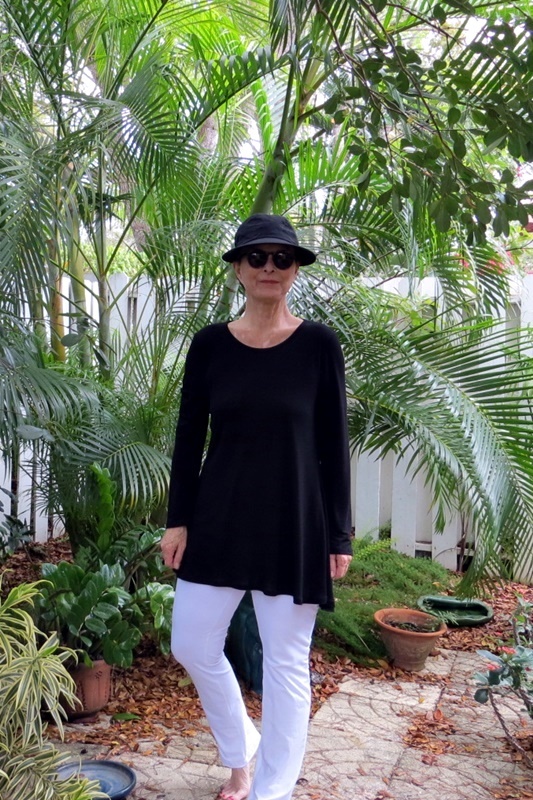 This is also a cotton spandex knit from Girl Charlee – mid-weight at 8.5 oz, with 4-way stretch. Let’s see – what else… Last weekend I put down 100 lbs. of fertilizer in the garden. Not an easy task! But it’s that time of year, and I need to fertilize ahead of the heavy summer rains. The palms are putting out flower spathes (pollen everywhere), and the mahogany trees have shed their leaves and are sprouting a beautiful new green canopy. The plants are hungry! I got the gang all together for a group pic – yes, I continue to play with my dolls. The smallest one (no head yet) is about 5.5″ tall, and she’s new. 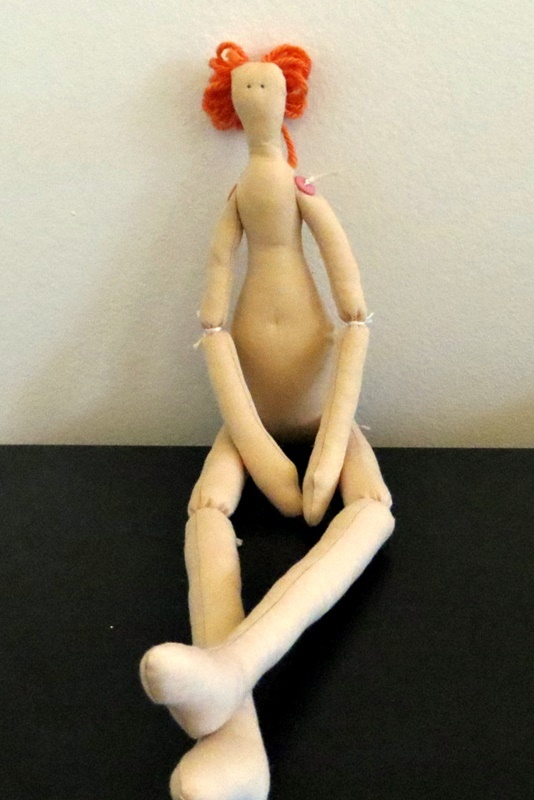 And the largest (alas, no arms) is about 20″ tall and was in my previous post on doll making. Note: The second one from the left is a Tilde-style doll. The web is (maybe unfortunately) full of patterns taken from the Tilde publications. It’s such an appealing doll, of course I gave it a go – but the design is absolutely not mine. All the doll parts are drawn with a Pilot Frixion Erasable Gel Pen on a double layer of fabric. These pens are wonderful! because the ink disappears with a warm iron. I use them all the time, and not just for the dolls – they’re great for marking notches and darts, or even writing, on any sewing project. I ordered mine from Doll Makers Journey, but I think many art supply stores carry them. Note: I’ve seen clicker-type Frixion gel pens at Staples, Target, etc., but I honestly don’t know how they do on fabric. These pens are also indispensable for drafting doll faces. Here’s a JoJo, all sewn, trimmed, and ready to be turned and stuffed. 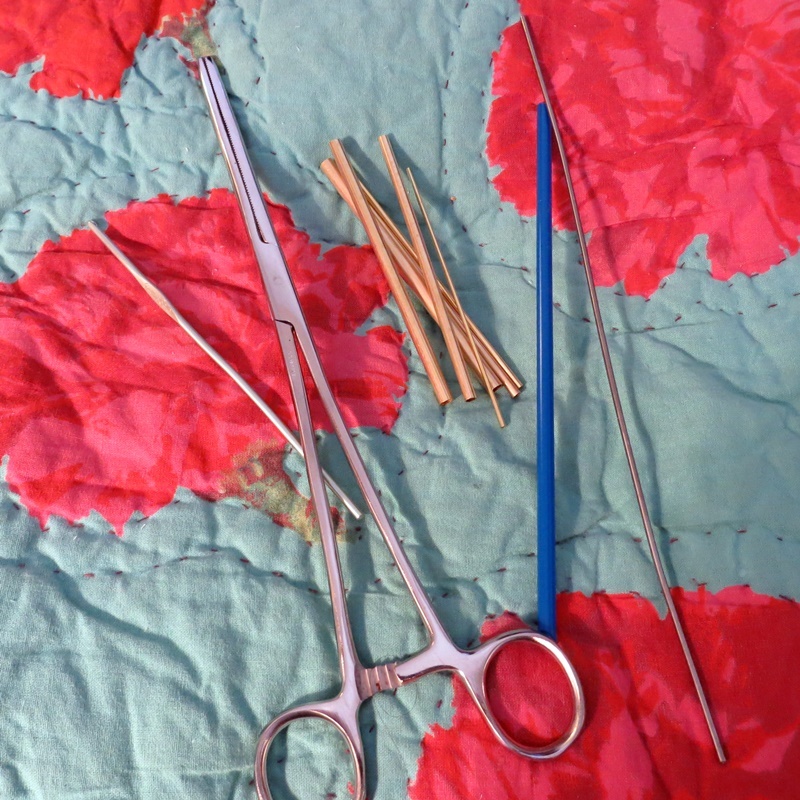 My main turning tools are various tubes, a 10″ hemostat, and a crochet hook (to push out fingertips and tight curves). The small brass turning tubes are a recent acquisition, also from Doll Makers Journey. They’re wonderful for turning little fingers, skinny arms, and ears. And then there’s the stuffing. It’s a great, mindless kind of thing to do with a good movie or the news on the telly. My very favorite stuffers are the chopstick and the cocktail skewer. I used my kitchen shears to make depressed circles on both ends of the chopstick, and the end of the skewer is naturally a little scuffed – the stuffing catches on both, making it easier to move along inside a doll part. I’ve also used a variety of orange wood cuticle pushers…whatever works! 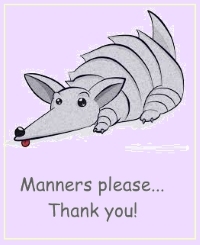 So far, I’ve been disappointed in the stuffing fork, which I bought specifically for fingers. It’s my most expensive tool, and I just don’t have much luck with it. I’ve watched it being used on YouTube videos, and it was impressive, so more practice should help. If not, I’ll put it in the kitchen drawer and use it to spear pickles! I’m sewing clothes, too, but I’m too happy in my PJ’s to do photos today.